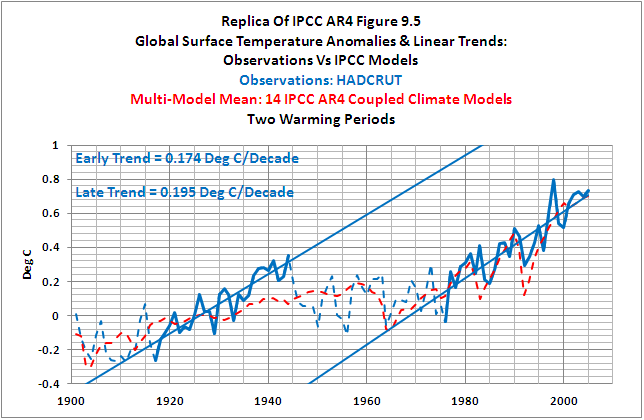 UPDATE: (February 13,2012): I’ve included an edited version of Cell a from the IPCC’s Figure 9.5 to the end of the post. And the YouTube description has been revised. The final sentence (in boldface here) has been added: The following narrated video discusses four quotes from the Fourth Assessment Report (AR4) of Intergovernmental Panel on Climate Change (IPCC). It then compares instrument-based Global Surface Temperature anomaly observations to the hindcasts/projections made by the IPCC in AR4 to see if those quotes are valid. The video clearly illustrates the fallacy of attempting to attribute the rise in 20th Century global surface temperatures to anthropogenic forcings. The following narrated video discusses four quotes from the Fourth Assessment Report (AR4) of the Intergovernmental Panel on Climate Change (IPCC). It then compares instrument-based Global Surface Temperature anomaly observations to the hindcasts/projections made by the IPCC in AR4 to see if those quotes are valid. 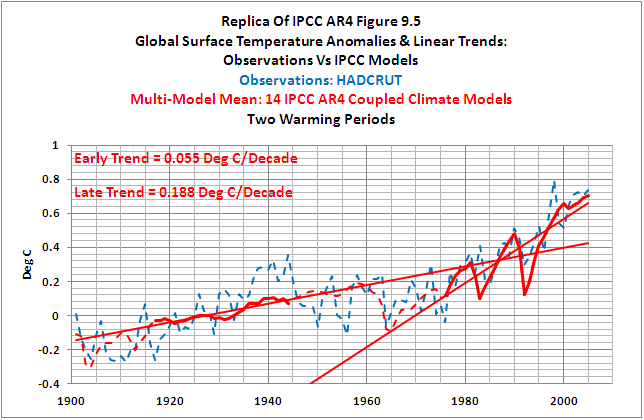 The video is similar to my post The IPCC Says, “The Observed Patterns of Warming…, And Their Changes Over Time, Are Only Simulated By Models That Include Anthropogenic Forcing”, which used Sea Surface Temperature anomaly data. The first of the four IPCC quotes is from the AR4 Summary for Policymakers, the second and fourth quotes are from Chapter 9 Understanding and Attributing Climate Change, and the third quote is from Chapter 3 Observations: Surface and Atmospheric Climate Change. A large version of Figure 9.5, including cells a and b, which were referred to and marked up a number of times in the video, can be found here. I presented seven new illustrations in the video. They are provided below. When I began researching the data for this post, I had hoped to use the KNMI Climate Explorer as the source of the model data. 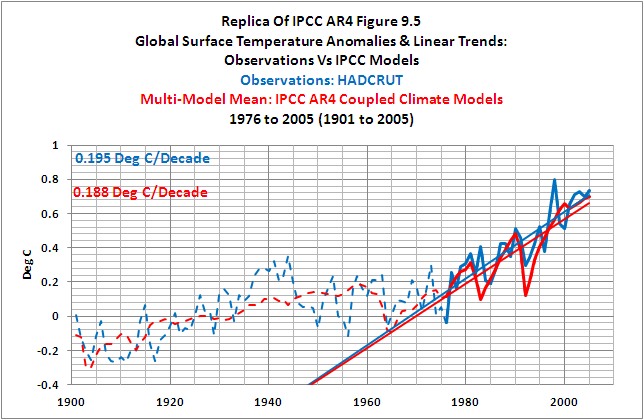 Unfortunately, the IPCC used two computer models in their Figure 9.5, Cell a, that were not included in the CMIP3 archives. These were the ECHAM4-OPYC3 (1 simulation) and GFDL-R30 (3 simulations). 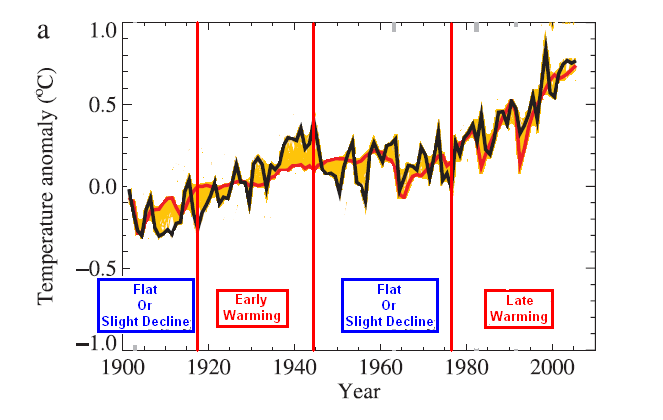 The IPCC discussed this in the Supplementary Material for Chapter 9. I was not able to find those outputs in an easy-to-use format, but they would only have added 4 ensemble members to the 52 that were available through Climate Explorer. The second problem I encountered was the majority of the 20thCentury hindcasts only provided data as far as 1999 or 2000, but Figure 9.5 included data through 2005. 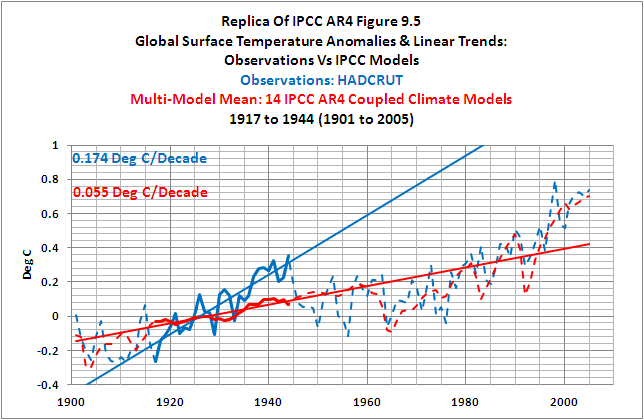 The IPCC, as they explained, spliced on the corresponding projections from the Climate Models, where they were available. 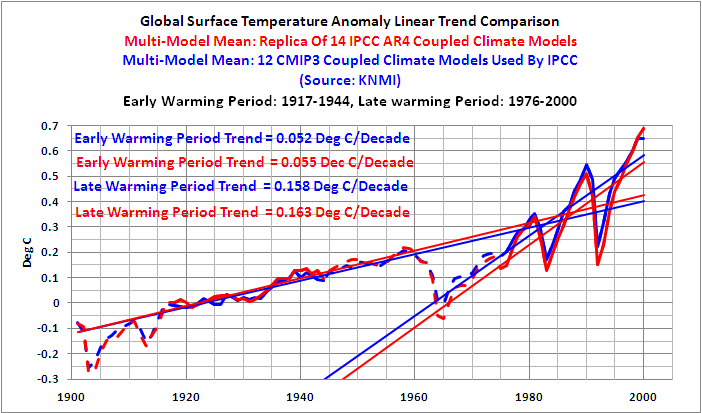 Since I was already short a few of the climate models they used, this seemed to be a lot of work for very little return, so I used the X-Y coordinate feature of Microsoft Paint to replicate the Multi-Model Mean data in Figure 9.5. As shown in Figure 8, below, the replica provided very similar results to the Multi-Model Mean of the 52 ensemble members available through the Climate Explorer. The differences would have no impact on the content of the video. There is one final note about ensemble member quantities. The IPCC notes that the Coupled Climate Model CCSM3 included 8 ensemble members, but there are only 6 provided through KNMI for the 20C3M hindcast. In the video I mentioned the 58 ensemble members used by the IPCC in their preparation of their Figure 9.5, so not to cause unnecessary confusion, even though I could only account for 56 ensemble members. My favorite graph in the video is the version of the IPCC’s Figure 9.5, cell a, where I’ve minimized the additional noise from the ensemble members, so that their graph now highlights the differences between the data and the model mean. 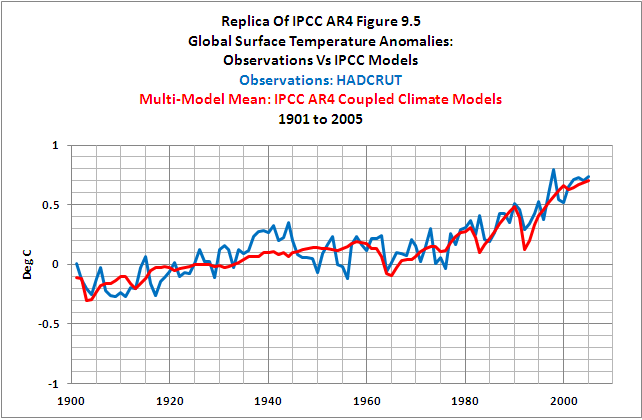 The HADCRUT3 Surface Temperature data used in the Observations-mean data in the video and the individual ensemble members of the CMIP3 climate models used in the multi-model mean data for Figure 8 in this post are available through the KNMI Climate Explorer. The HADCRUT3 data is found at the Monthly observations webpage, and the model data is found at the Monthly CMIP3+ scenario runswebpage. This entry was posted in Model-Data LOST, Video. Bookmark the permalink. Bob, There are 4 components to the models resulting in temperature changes; Changes in anthropogenic forcings, changes in natural forcings, volcanos, etc, simulated natural cycles, and quasi-randomness. Simulated natural cycles aren’t something the modellers like to talk about, but the models do seem to simulate natural cycles to a degree. Although they may characterize this as randomness, it’s not randomness when it comes to determining the temperature trend. The quasi-randomness I refer to has no effect on the temperature trend (averaged from the model runs), it just produces the variation in the individual model runs. Which is deceptive of them, because they imply they are simulating natural climate variation through quasi-randomness which is nonsense. Otherwise, note how the models over-estimate the short and medium term (1 to 3 years) effect of volcanic eruptions. This indicates to me the degree to which they use aerosols as a ‘fudge factor’ in the models. Their anthropogenic aerosol sensitivity is 2 or 3 times to high. Just to clarify, when the modellers talk about randomness, they are generally referring to natural climate variation, which is randomness in the anthropogenic warming signal. However, natural variation is not randomness in the global average temperature, which is composed of an anthropogenic component, a natural variation component and randomness (and various forms of bias) in the global temperature signal. The topic of discussion in the video was output, not input. 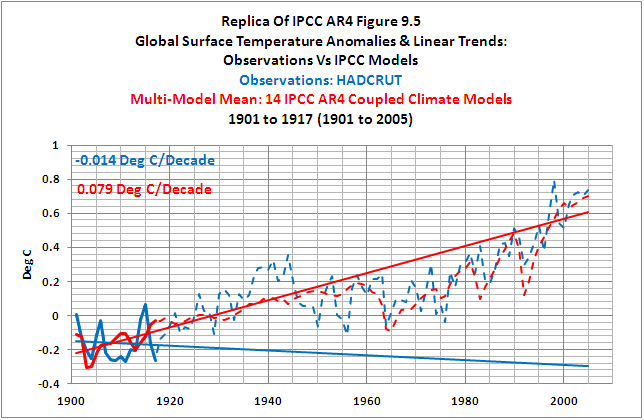 Pingback: Tisdale schools the website “Skeptical Science” on CO2 obsession | Watts Up With That? Very good post Bob, Thanks. 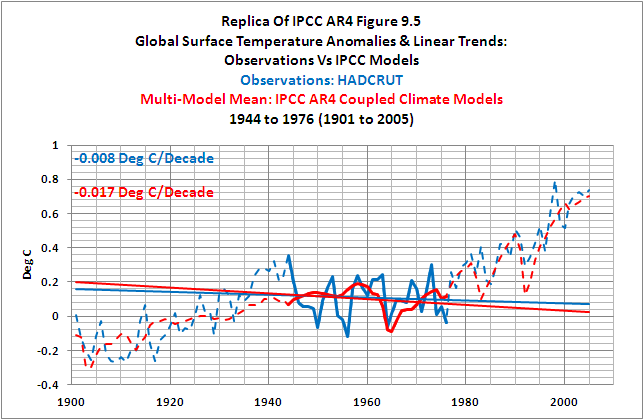 Yes, IPCC models have so little skill they have to be cherrypicked to show some agreement to reality.